Just Shutters Leeds are the number one choice for stunning plantation shutters in Leeds. 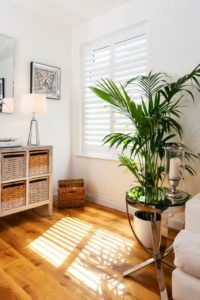 Our experts have a passion for interior design, and love nothing more than finding the perfect shutters to suit your home. Start your Just Shutters journey by calling our experts on 01757 602459 or using the buttons below. -Ease of cleaning. Cleaning shutters is as easy as wiping them clean of dust. -Child safety. Shutters do not trap fingers or have any hanging cords. Therefore, they are perfect for homes with children. -Enhanced security standards. Shutters allow for greater privacy and strengthen your windows. -Ambience control. You can control the light coming into your interiors. -Durability. We even offer a lifetime guarantee! Furthermore, shutters are truly stunning! They make for great stand out features in any home, even more so as our shutters are made to measure. Get inspired by browsing our galleries of shutters in our customer’s homes. Contact your local shutter expert on 01757 602459 to start your Just Shutters journey. Our dedicated team are on hand to ensure that your options are discussed with you and can book a home design visit. providing the highest standard of customer service is a priority for all Just Shutters staff. They will ensure that your shutters are the finest quality, whilst treating you in the friendliest and fairest way. Therefore, we are thrilled to have been recognised with a 9.9/10 rating on Checkatrade.